The DeckLink Output module is used to send audio & video from any source to a Blackmagic DeckLink card like the Intensity Pro (HDMI) or DeckLink Duo (SDI). The video destination, i.e. the DeckLink card (port) to which the video will be sent. 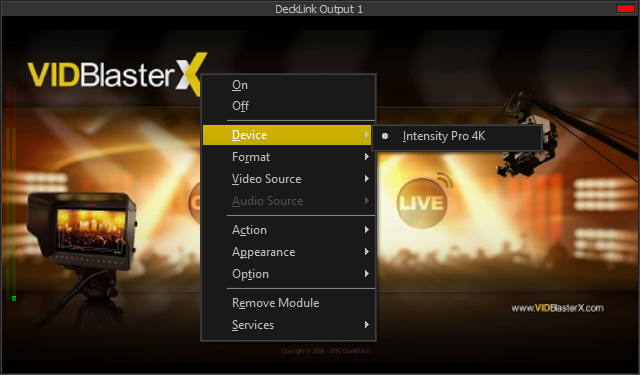 Select the DeckLink card's output video resolution and frame rate. Note due to a bug introduced after Desktop Video version 10.8.3, interlaced modes are only available when the Low Latency flag is set. Set this flag when low latency video output is required. Note this disables audio. Low latency mode will typically be used for studio floor monitors, live-event monitor feeds and IMAG. On modern (4K) DeckLink cards this will bring latency down to one frame or less.